News Archive - Page 2 of 8 - Lightspeed Systems, Inc.
Relay made headlines last February when Lightspeed announced the release of Threat Check, a Relay feature that provides schools with information that can help identify high-risk behaviors and prevent school violence, self-harm, bullying, and more. School personnel can flag high-risk students and input offline activity such as violence, threatening speech, or bringing a weapon to school. This synthesized insight gives schools a more holistic picture of potential threats, as well as indicators of when high-risk students are escalating toward violence. The ed-tech company offers its full product line through REMC SAVE, giving K-12 schools the opportunity to purchase device filtering, monitoring and management solutions at affordable prices. AUSTIN, TX. — Ed-tech solution provider Lightspeed Systems is an awarded vendor through REMC SAVE, making its device filtering, monitoring and management solutions available to K-12 schools across the state of Michigan. REMC SAVE works with top technology providers to procure large-volume bid prices on a variety of educational resources. Through REMC SAVE, Michigan schools now have the opportunity to purchase all Lightspeed Systems solutions at special pricing. Founded in 1999, Lightspeed Systems offers integrated and multi-OS software solutions — device filtering, monitoring, and management — that are developed especially for K-12 education. Lightspeed Systems works with schools to make learning safe, mobile and easily managed. Partnered with 6,500 districts in the United States and 25,000 schools around the world, Lightspeed Systems offers integrated solutions for smarter K-12 school networks: Relay, Web Filter, Mobile Manager and Classroom. To learn more, visit https://www.lightspeedsystems.com. REMC SAVE is provided as a service of the REMC Association of Michigan for all Michigan schools. The project provides large volume contracts for a variety of educational resources. By using REMC SAVE contracts, Michigan schools have saved more than $729 million since 1990. Every dollar saved through REMC SAVE today is one more dollar to invest in instruction tomorrow. AUSTIN, TX. 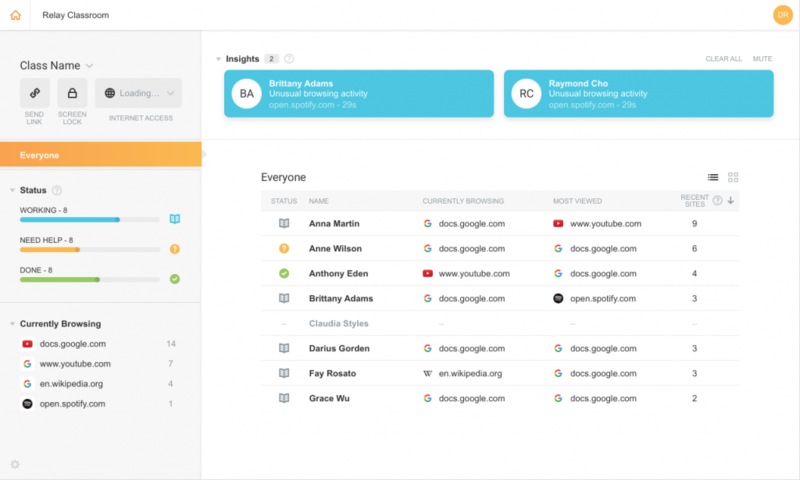 — Today, Lightspeed Systems announced the release of its Smart Agents for Mac OS and Windows, bringing multi-OS support to its K-12 school filtering/monitoring solution, Relay. These revolutionary, patent-pending agents — which provide seamless mobile and SSL filtering to student devices — are available in beta to Relay customers and will be released for iOS in subsequent weeks. Lightspeed has honed its proprietary database — the core of its web filtering products, Relay and Web Filter, designed for K-12 education — over almost 20 years. AUSTIN, TX. — Ed-tech solution provider Lightspeed Systems, the market leader in K-12 device filtering, achieved a new milestone today as its URL database hit 65 million websites. Lightspeed Systems’ proprietary database of sites categorized for K-12 education powers Lightspeed Systems Relay, a cloud-based device filtering/monitoring solution for every operating system, and the Lightspeed Systems Web Filter, a multi-OS device filtering solution with multiple deployment options. The strength of any content filter is dependent on the strength of its database: how large it is, and how well-categorized its URLs are. This is particularly true in K-12 education filtering because, due in part to the Children’s Internet Protection Act (CIPA), schools have a mandate to protect children from inappropriate and explicit content. Lightspeed Systems has carefully cultivated its database since the company began filtering school networks in 1999. Lightspeed’s database uses a combination of artificial intelligence and real-time analysis to categorize websites, but AI alone can’t accurately read images, videos and foreign languages. Thus, its database also leverages a combination of human and robot teams to categorize the web in order to ensure schools using its filters are giving safe, appropriate access to students. Its 65 million websites are organized based on what is suitable for children and for educational environments. Relay and Web Filter can also block new, unknown URLs until they are categorized, giving Lightspeed another edge on competing products. Additionally, Lightspeed has categorized approximately 90 million YouTube videos to give students safe access to streaming video and block bad content; this feature, called Smart Play, can be enabled in the Relay or Web Filter with the click of a button. AUSTIN, TX. — Today, Lightspeed Systems made its new K-12 filtering and monitoring solution, Relay, available for purchase in Amazon Web Services (AWS) Marketplace. 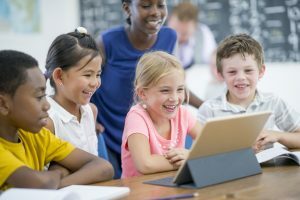 Lightspeed’s multi-OS Software-as-a-Service solution was built to help K-12 school IT departments filter, monitor, report, and locate school-owned student devices. Relay can be purchased in AWS Marketplace for annual pricing of $9 per device. There are more devices in K-12 schools today than ever before, and IT departments need to maintain control of those devices to keep students safe and focused on learning. The cloud-based, multi-OS Relay eliminates the need for multiple systems to filter, monitor, and manage school devices with features for granular user activity reporting; content filtering, including SSL sites, with flexible policies; real-time suspicious activity alerts; and geolocation for lost and stolen devices. All these tools are available in a single, streamlined user interface. Lightspeed Systems partners with schools to make learning safe, mobile, and easily managed. Partnered with 6,500 districts in the United States and 25,000 schools around the world, Lightspeed Systems offers integrated solutions for smarter K-12 school networks: Relay, Web Filter, Mobile Manager, and Classroom. To learn more, visit https://www.lightspeedsystems.com. New device monitoring system Classroom uses a proprietary algorithm to alert teachers of unusual student browsing behavior. AUSTIN, TX. 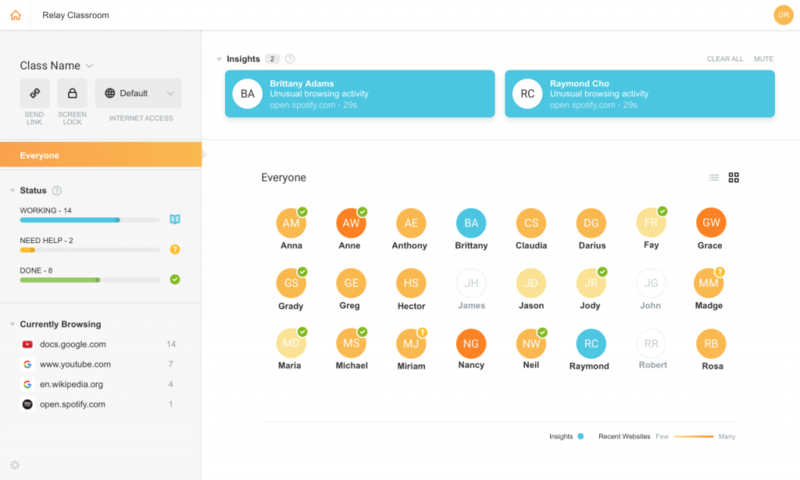 — Lightspeed Systems, the leading education technology provider for K-12 schools, released a new student classroom management product today. Lightspeed Systems Classroom is a cloud-based software solution that uses a revolutionary technology to alert teachers when students are browsing off-task on classroom devices. Lightspeed Systems Classroom gives teachers insights into unusual student browsing behavior. Most classroom management solutions give teachers views of classroom device activity to, in theory, help them pinpoint students who are distracted or falling behind. In practice, teachers struggle to track the activity of 30 students at a time, and monitoring all those screens keeps teachers tied to their desks and devices. Classroom — included at no additional charge with the Lightspeed Systems Relay web filtering solution, and available for purchase as a standalone product — revolutionizes the traditional model of classroom management by using a proprietary algorithm to identify students with unusual browsing activity (i.e., those who are distracted or falling behind). Teachers receive notifications of that unusual behavior, freeing them from their desks so they can focus on other tasks.